In my years of practice as a general surgeon in the United States I saw my share of patients and families who made decisions and had dearly held beliefs based on superstition, misinformation, just plain bad information, and old wives tales (if you expose cancer to the air it grows faster was the most common one, and I know some of you are thinking, “Wait a minute, that is not true?” No it is not.). But like everything else I have experienced living here in Tchad, I have never experienced the superstition, wives tales, and closely held beliefs in the concentration and the intensity that I have here. There are lots of sociologic and anthropologic reasons for this, but it doesn’t change the fact that every day I witness another bad decision, based on faulty premises and/or bad logic, which has predictably bad outcomes. It is rainy season, and a consequence of not having the money to afford kiln dried bricks is that you have to use sun dried bricks to build your house. In Tchad bricks are made in exactly (and I mean exactly) the same way the children of Israel made bricks for the Egyptians 3,400 years ago. Sun dried bricks are cheaper, but they tend to disintegrate in the rainy season. So, during the second or third rainy season walls start to collapse, sometimes suddenly, sometimes hurting people. Little Koumda was in the wrong place at the wrong time and the wall fell on him breaking his leg just above the ankle. 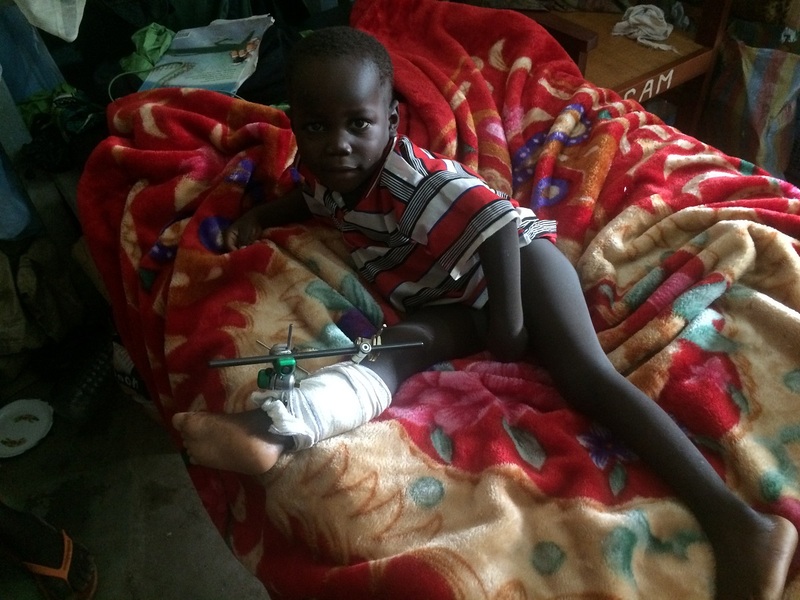 His parents quickly took him to the nearest health center, staffed by a nurse, who assessed him and made the correct diagnosis, open fracture of the left tibia and fibula. He (or she) then did what they are trained to do with all open wounds, he carefully closed the wound, making sure all the dirt and brick pieces were kept inside where they couldn’t get out and attack anyone else. The fracture was stabilized with a Chinese splint. This was on a Tuesday, by Friday Koumda predictably was draining pus from his nicely closed but poorly stabilized open fracture wound. His parents took him to our sister hospital, Bere Adventist Hospital, where Dr. Olen Netteburg (a great guy and my nephew) opened the wound, cleaned it out, started him on antibiotics and called me. His surgeon (also his father-in-law) was on furlough in the US, so not available. Olen was able to convince the family to come to our surgical center in Moundou to try to save Koumda’s leg. 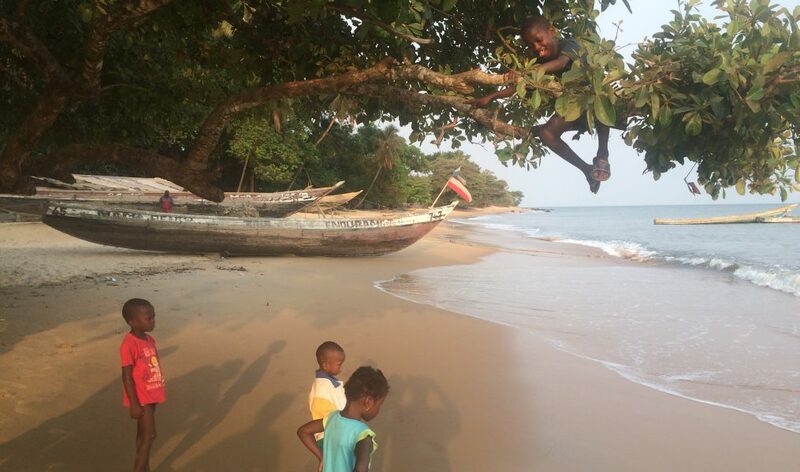 About three days later, Koumda and family showed up on our doorstep. Thanks to the care he got at Bere, the leg didn’t look too bad, although it still had pus coming out and definitely needed good stabilization. It wasn’t clear if the bone was still alive, but it wasn’t clearly dead, so we felt like it was worth it to try to save the little guys leg. Because Olen had given me a heads up I had been able to search through our supplies and find material small enough to put an external fixation device on him. We took him to the OR and we prayed, cleaned up the wound, and we prayed, cut away the dead and infected tissue, and we prayed, got the bone reduced, and we prayed, put the ex-fix on him to keep it reduced and then tried to cover the fracture with tissue to help it heal, and then we prayed. The first thing Koumda did after surgery was to prop his newly reduced and ex-fixed leg on his other knee. I thought, “OK, it must not hurt too bad, this hopefully is good.” He then promptly broke down the flap I had tried to make and the bone and fracture were again exposed. Pus continued to come out of the wound, but not a lot, and each day it seemed better. Koudma with the little pediatric ex-fix on his leg. Today when I made rounds, Koumda and I worked some more on his high and low fives, and then I changed his dressing. The donor site for the flap is healed, the bone is now completely covered with healthy red tissue, with no pus. He has no pain, he still likes to cross his fixed leg over his other knee, and he is cute as can be. Koumda should, by the grace of God, do just fine, his fracture doesn’t involve his growth plate, and so he should grow normally. Ten year old Yassine was riding on a moto, which is how most people get around here. I don’t know who he was with, but there was an accident and Yassine fell off. For some reason it is the left tibia and fibula that are most often fractured in moto accidents, and Yassine is no exception. Like Koumda he suffered an open fracture of both the tibia and fibula. Like Koumda, his family took him to the nearest health center where his leg was carefully assessed and then just as carefully sewn up, making sure all the dirt, leaves, rocks and oil were kept inside. In a few days, surprise, surprise, pus was pouring out of his wound, and then it completely broke down. Unlike Koumda, Yassine’s family kept him at home for two weeks before they finally came to us. He arrived when I was in N’djamena and when I got back and took him to the OR and took off his dressing my heart sank. The fracture was not too bad, it was a clean break, but the bone of the distal end toward his foot was completely stripped of tissue. The wound was dirty, full of pus and dead and dying tissue. I had told the family we would try to save the leg and the bone wasn’t absolutely dead yet, so we prayed, we debrided dead tissue, we prayed, we reduced the fracture, we prayed, we got the ex-fix on, prayed, and I tried to get some healthy tissue to cover the bone with, and then we dressed the wound and prayed. This afternoon Patrice found me and told me the family had met. One of the big brothers told the family that he (the big brother) was all powerful and he would get the leg healed and Yassine would again walk normally. So the family refused the amputation. We took off the ex-fix as it is now useless and dressed his wound one last time and sent him home. Hopefully they will take him to another hospital and will get a second opinion that he needs an amputation. But as is usually the case, the family will search until they find someone who will promise to heal his leg, and will care for him with poultices, rabbit fur and only God knows what else until Yassine becomes septic and dies. Why does God answer some prayers and not others? That I will not know until heaven. But I suspect it has a lot to do with our free will, and with our superstitions, deeply held beliefs, and prejudices. As he was being loaded into a car to leave, one of my nurses came into my office. She was so angry she was trembling. “This old man he played one, he played knick-knack on his thumb…. And so on up to ten. I showed his son the x-ray and explained to him what I wanted to do and why, and also pointed out it would be a lot less expensive. His son agreed and then explained it to his father in Ngombaye. He agreed, this was great, everyone agreed, me, the family the patient. It was a moment to be savored. That afternoon McKennan Cook (our med student from LLU) and I put a long leg cast on him. It looked great, ankle was in alignment, all was right with the world. I told his son we would keep him overnight, and in the morning when the cast had cured and hardened we would teach him to walk with crutches and send him home. Great plan. In the morning we saw him in the Salle de Reveil, and felt his cast. It was still wet, and the back part was mush. That was weird. It was Tchadien casting plaster, but still this was not how it usually is. So we watched it throughout the day yesterday. It never really set up in the back, but it did in the front. Last night I told McKennan we would have to redo it this morning if it didn’t set up during the night. This morning we came in to find the cast starting to disintegrate, and we found a very annoyed nurse who complained that she couldn’t keep the malade (patient) in bed during the night. He kept getting out and crawling all over the floor. That explained the cast falling apart. So this morning McKennan and I redid the cast, adding 5 more rolls of plaster. This time it set up quickly and the cast was already hard by the time we left. Since it is Sabbath I only see emergency cases, but when I got called over to see a 12 year old with a fresh femur fracture, I saw my old man, sitting up on his bed with his cast hanging over, propped up on the side bar of the bed. I checked him out and he had already managed to make the back of his once hard cast mush again. He told the nurse he wanted to go home, and she told me once he gets home he is going to rip the cast off. I believe it, because when I left he was standing on his cast, which will be destroyed by morning. Long ago when I was a baby doctor I learned never to argue with a patient who didn’t want me to care for them anymore. If they wanted a referral to Portland, Seattle or Spokane I was always happy to do it for them. Here when a family or patient want to go home, or refuse a treatment I let them go. I don’t argue or try to convince them otherwise. I simply give them my advice, and why, they can take it or leave it. Same thing with this old guy. If he is going to destroy my cast, I would rather have him do it at home where I can’t see it then here, where I have to watch. I left really annoyed, he was destroying my hard work. I was happy I hadn’t operated on him and tried to plate the fracture or use an external fixation, only God knows what he would have done with that. But I was still annoyed. I told McKennan what had happened to all his work (he was the official leg holder and reduction holder), and then I realized or thought about why. But it takes faith to believe that it will, it takes faith to believe that putting up with this misery for 6 weeks will result in a miracle. And how can I expect him to have faith in someone who doesn’t look like him, who is younger, who is clearly not from around here, and who can’t even speak properly. Have to admit, I wouldn’t have much faith in me either. All that being said, this old man who played last, who played knick-knack on his cast, is going to end up a cripple, with a deformed ankle at best, and never be able to walk well again, if at all. Just because he didn’t have faith in someone who wasn’t like him, someone different, who had different methods, different ideas, despite his efforts to explain all that to the old guy. And then I thought, wait, this sounds familiar. Haven’t I heard of Someone who wasn’t from here, Who came with different new ideas, Who spoke different words than we had heard, Who came with a different way. “Just have faith,” He said, “Believe what I am telling you even if you don’t understand it all, and you can live forever.” Hmmm….